Because we eat with our eyes. Since I got my Samsung Note 5, I’ve been encouraged to draw my ideas. Thanks to Chef Fregz who showed me how. What the stylus and phone help with is visualizing the possibilities, on the go – you can erase, check, sketch, add notes and do much more. The key? Balance. 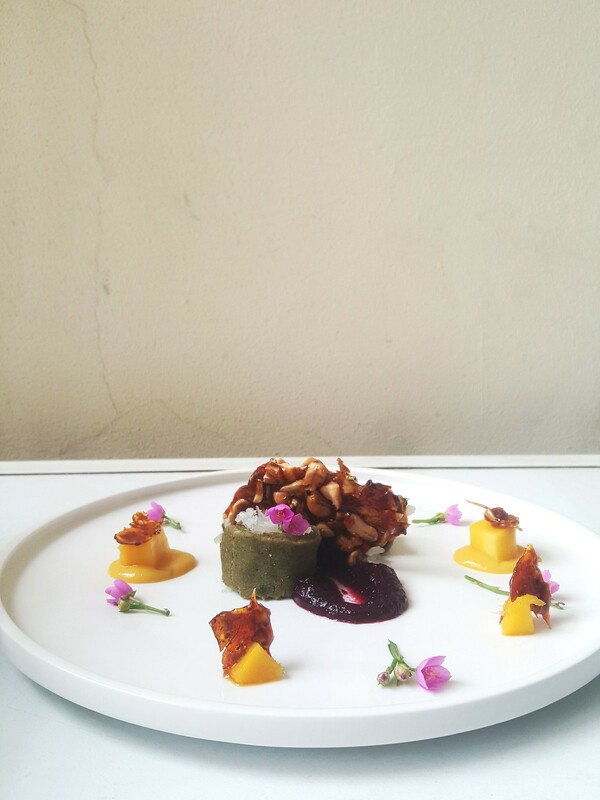 When I sketch the plate, I can see the balance of colours, I can explore tastes in my head, I can investigate the options. All in a few minutes. The process of creating anything is a compound of many steps, many different sources of inspirations. This current high I’m on with serving up Nigerian food is the result of #Big60 and watching Masterchef Australia – the best Masterchef series in the world. I also knew I wanted to use a flat, white plate and so I began with a circular template. What are the elements to complement your dish? The star of my dish was green pancakes stuffed with coconut. I wanted a mix of fresh and vibrant colours as well as textural contrasts. ‘sauce’/ contrast – I added some zobo pepper sauce to the dish to cut the sweet and soft of the green coconut pancakes. This was dessert so I didn’t need any ingredient in large quantities. I decided that I would ‘centre’ the main elements and ‘garnish’ the plate with the other elements. I sketched them as I thought I would like them to look. Placement is everything so it is good to give it some thought. Use your phone palette to select and check colours, and colour combinations. Once I had drawn my design, I set about preparing my work station. I ensure I had to hand, all the required elements in small dishes/ plates with cutlery and also serviettes/ tissues to wipe the plate. I had my phone in front of me and proceeded to build the plate. And this next point is key – execution may require making on-the-fly changes. Which is what happened to me. When I placed the coconut pancake cross sections with the chunk of peanut brittle in between, I didn’t like the way it looked. Also, one of the cross sections began to unroll so I set it on its side – proof that the best laid plans will sometimes unfurl different from how you planned. Just find an alternative. I didn’t like the way the mango cream looked over the chunks so I reversed the plan and put the cream on the plate and the chunk on top of it. I also changed the placement of some of the brittle pieces, setting it on top of the mango chunks as opposed to offset from it. But also from the side. See how nice the mango chunks sit on the cream :). I loved the visual representation and the translation of the idea, the concept to plate. 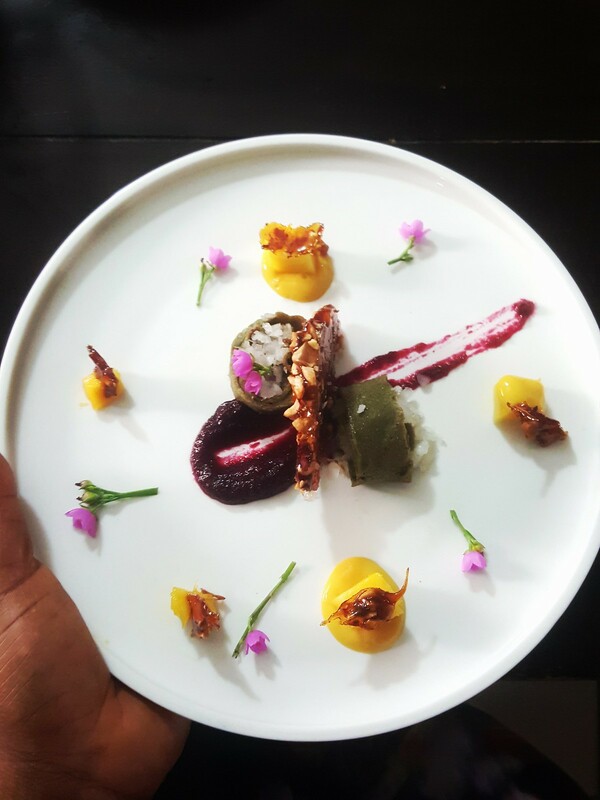 I hope to share more plating techniques as I learn. 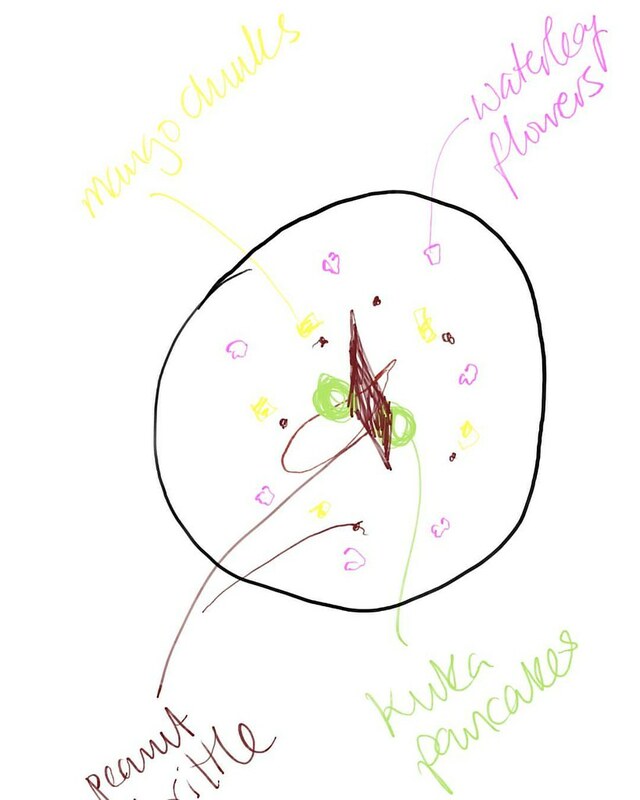 Chefs put pen to paper to sketch out a new dish, mapping out flavour and visual appeal. My take away – I need to consider placement of elements which will guide how a diner would ‘consume’ the dish.